It is almost impossible to explain to people who are not retired, but sometimes we can not figure out where the days go! One of the first questions Mary and I go over almost everyday is, “What day is it?” Then we can figure out if the garbage goes out or if the water delivery man is coming. Other than that the days and weeks zip by at a surprising pace considering we are retired and have few commitments to take up our time. Anyway – today I have a couple of spare minutes and thought it would be a good time to report on a few of the things we have been doing of late. We have reported in the past that John was asked almost two years ago to sing with a traveling band of karaoke singers organized by our friend Belffort Pico, the manager of the local bank COACMES. While singing karaoke does not generally merit a blog post, this is really a much bigger deal than karaoke at the local cafe or bar. The events are well advertised and the bank has invested a great deal of money in huge speakers, projection equipment, lights, and staging. 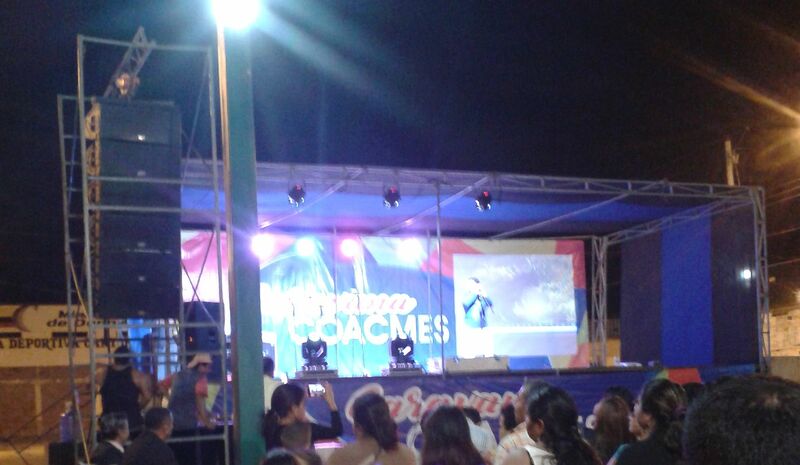 Here is a picture of the stage I took at an event in Tosagua some months ago. COACMES plans to do performances about once a month until they have performed in all of the cities where branches of the bank are situated. I first performed with the group in Bahia and since have traveled with them to San Jacinto, Rocafuerte, Tosagua, Flavio Alfaro, and (just last week) in Crucita. Some of the singers also perform at the annual COACMES expat dinner. 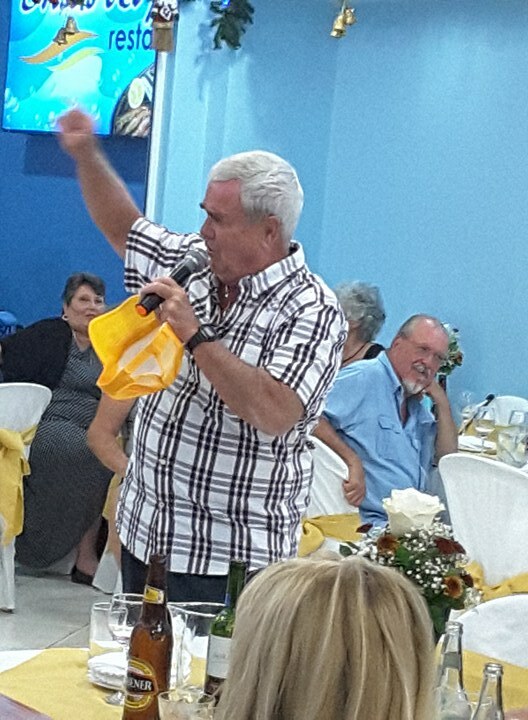 Here is a picture of me singing at the last dinner. As I mentioned, the events are well advertised and, being free, are well attended. The smallest group we have seen was perhaps in Flavio Alfaro where a torrential downpour delayed the start of the performance for about an hour and a half. We still had two or three hundred people in attendance sitting on wet chairs and dancing in the aisles. Here is a picture I took from the stage just before my performance in Tosagua. Many of the onlookers sit in seats, but generally about as many more people stand around the back and sides of the street singing along and dancing. The atmosphere is certainly festive and it is quite an honor to be asked to sing with the group. One funny note is that after I first agreed to try to sing with the caravana, Belffort started advertising the event as being an “international” extravaganza! There is one performer who came to Ecuador thirty years ago or so from Spain, but he does not always make it. Generally I have the distinction of being the “international” part of the program and the only gringo singing in English in the group. A friend recorded the first song I sang in Crucita last week on his cell phone. Although the recording is not great, you can see a bit of my act. I had difficulty hearing my singing over the music at the beginning and it took me a few bars to feel like I had it right, but here it is. My Spanish is so bad, but the crowd got the impression. I told them that although I am from the United States I now consider myself to be an Ecuatoriano. That gets a cheer, but not nearly as much as when I tell them that, more importantly, Yo soy Manaba! (meaning I am a Manbitan)! Manabí is the local province (ie. state) and there is a great deal of regional pride in being from Manabí! In addition to the COACMES Caravana tour I was also asked to help out at a local school in Bahia for their music appreciation day. They had many very good singers and lots of other musical performances, so the director asked me if I could do something different. I did a few numbers on my harmonica. A friend who is visiting San Clemente from Utah attended and recorded that performance on her cell phone. For some reason that video can’t be embedded, but you can view it on Facebook by clicking on the “Watch on Facebook” below. Muchas Gracias! El grupo es muy divertido. Thanks for your comment. Enjoyed your singing before so know it is a great way to have others enjoy it too. Thank you, Eileen. It is fun to sing or otherwise perform for Ecuadorian nationals. They sing along, dance, and have fun with you, making the performances very rewarding. Thank you, Scotty. Hope all is well with Jaime. Love you! ¡tu canto y tu sonido español son muy buenos para mí! Muchas Gracias, my bilingual friend! I still make plenty of errors in both the singing and speaking Spanish, but the people seemed to enjoy it and it is fun. Life is good!